Losing a parent is painful. It is earth shattering and completely disabling. Lucas Tremaine’s loss was due to negligence at Drax Enterprises. Even more than that, his mother was left dependent on valium to look remotely sane. He wished he could bring them to book but Drax is a big corrupt entity, what can one little guy do? He wished more than anything to exact revenge on the people who did harm to his family. Lucas wished all kinds of discomfort and unhappiness for the people who caused his father’s death. So blinded by the quest for revenge, it sometimes impairs his ability to properly collect and analyze the evidence. Drax Enterprises will not pay for their sins in the conventional way, so Lucas needs to do some unconventional and dangerous things to get justice served. With the help of Reuben Klein, his best friend, they search the old underground subway system of the city of Cincinnati. The further they explore, the more sinister and complicated the corruption and fascism of Drax Enterprises gets. Lucas, Reuben and everyone who is near and dear to Lucas is in danger. Will Lucas find what he so desperately seeks? Will Drax Enterprises eventually pay for their sins? After facing three generations of Drax Enterprises leadership, will Lucas escape unscathed? 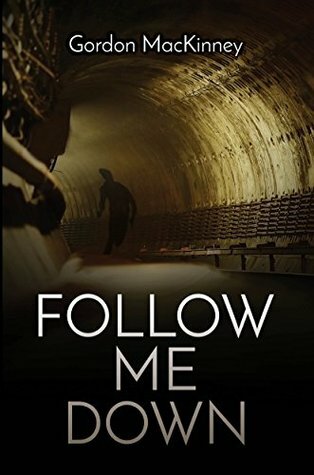 Follow Me Down by Gordon MacKinney is an intelligent thriller with a lot of ironic situations and lively conversations. The characters are complex but still relatable. Lucas’ need for vengeance is understandable to anyone and the reader will find himself rooting for him. This book is an interesting look into the lives of urban explorers. The reader gets to explore an underground rail systems not yet explored. The authors research and attention to detail is evident with the historical accuracy of the story. Gordon MacKinney’s description of the scenes is vivid and instantly transports the reader. One can almost smell the heavy air inside the tunnels. The love stories therein are especially heartwarming. The love between father and son is a beautiful narrative that is developed throughout the book. His admiration and love for his former boss and photojournalist, Alfred Blumenfeld, feels organic and true. I truly appreciated the authenticity of the character relationships in this novel. Action, suspense and treasure hunts are among the simple pleasures. The adventures of Lucas’ endeavor are captivating and make for a great read. The end reveals a side of Tony Drax that you least expect, but makes for a good ending to the story. Spinner is a refreshing addition to the science fiction and horror genres. The book gives readers a new perspective as the main characters are not your usual shiny protagonists, but rather a group of boys, all of whom have some form of disability or handicap. The main character, Alex, is both impaired mentally as well as physically, bound to a wheelchair. This is not the only thing that sets Alex apart, though. Alex is a spinner, capable of taking on others emotions, physical ailments, and pains before they disappear entirely. A trait that finds him unknowingly being watched by those with ulterior motives and a far more sinister entity as well. 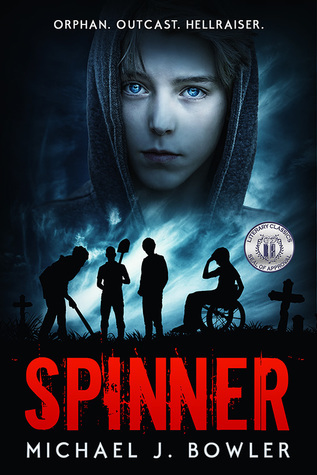 Spinner definitely brings something new and refreshing to the table with its focal characters being those typically dismissed and often belittled in our society. Bring in the science -fiction/horror vibe and Michael J. Bowler definitely writes to catch your interest. The story is original and cut from a different cloth which is refreshing. Although sometimes sentences can run on or become focused on small details, almost Charles Dickens-esque. It leaves little to the imagination as each character and scene is described in detail. The author does a wonderful job of presenting the main characters with disabilities as people, not just a subset of society to be catered to. Each character, though their disabilities are mentioned and made apparent through their interactions, are easily seen as teenagers with their own opinions, personalities, and mindsets. The fact that they’re disabled rarely comes to mind throughout unless the story itself points to it, giving a refreshing and normalized perspective. Bowler uses a lot of different aspects and mannerisms stereotypical of a screen-teen. There are many dramatizations and immature reactions that detract from the characters otherwise superb development and depth. I found this contemporary story easy to relate to and understand. Spinner has a lot of interesting and refreshing concepts that I felt kept the story thrilling and suspenseful.